If you missed your first chance, don't do it again! GET IT NOW WHILE YOU STILL CAN! Introducing the new and improved. Specially designed by a team of professional. Magicians and custom manufactured by a. Leading tent fabricator, the Shadow Tent is. Every magician's dream come true. The Shadow Tent is durable. Extremely light weight, packs super small. Sets up in minutes, and it is affordable. Dimensions fully set up: 5' by 5' 54" tall inside 65" to the top of the poles The inside of the tent is a little less than 4' by 4' at the base. Dimensions in bag: 30" long 8" wide (considerably larger than the actual tent rolled up, so it is really easy to pack in and there is room for your light and extension cord). The Shadow Tent is made with the finest materials, including super light-weight aluminum poles. It is specially designed to have the best angles of any shadow box on the market. (notice the pole sleeves create natural flaps that easily conceal more than one person if you like). There is a zipper in the front that makes the tent look like a normal tent and the zipper. Can be used to show the tent empty. The whole front panel brakes away with. Velcro tabs for a real cool appearance. 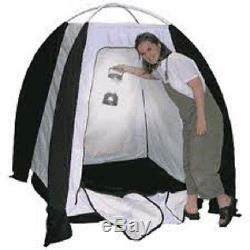 The tent is specially designed to be able to revolve 360 degrees with a person hidden inside. There are a few hidden poles for stability and a hole in the top back for the light. And the creative possibilities are endless! I don't want other magicians to have this, I would like to be the only one. " - Mac King "This is a great idea.... I can't wait to use it. I have seen A lot of Shadow Box illusions. And this one is the best! Gary Darwin (Magic Historian, Magician, and Author). And it packs a punch! An excellent portable illusion for the working professional. Andrew Mayne (host of the Magic Radio Show). Seeing it up close and in action I can say. That it is well made, packs really small, and can up your performance. Scott Alexander (magician, dealer, and inventor). "The old cliché "Packs small, plays big definitely applies to this illusion. With today's travel expenses, every magician ought to have this one. Tony Hassini (founder of International Magicians Society). A girl from light has always been mysterious and. This illusion really brings you both. Rocco (Magician and magic Developer). Some illusion ads brag that it will fit in the trunk of your car. This one will fit in the little basket on the front of your bike. Ricky Brandon (Las Vegas magician and consultant). "Very well made to last years". "I again recommend this illusion very highly". Be sure to check out my other items. Also feel free to add me to your favorites list. The item "Creative Magic Shadow Tent Stage Illusion Trick Children kid box CM appearance" is in sale since Saturday, August 1, 2015. This item is in the category "Collectibles\Fantasy, Mythical & Magic\Magic\Tricks". The seller is "mattadamsmagic81" and is located in Madison, Alabama. This item can be shipped to United States, Canada, United Kingdom, Denmark, Romania, Slovakia, Bulgaria, Czech republic, Finland, Hungary, Latvia, Lithuania, Malta, Estonia, Australia, Greece, Portugal, Cyprus, Slovenia, Japan, China, Sweden, South Korea, Indonesia, Taiwan, South africa, Thailand, Belgium, France, Hong Kong, Ireland, Netherlands, Poland, Spain, Italy, Germany, Austria, Israel, Mexico, New Zealand, Singapore, Switzerland, Norway, Ukraine, Croatia, Malaysia, Brazil, Colombia, Panama, Jamaica, Bahamas, Viet nam.